Mary Cady is the 2013 recipient of a water feature through the Healing Waters Project. When Mary Cady’s breast cancer was discovered incidentally during the golden years of her life, Mary opted to skip treatment. It was a decision her daughter Gayle Kall initially couldn’t understand. Now, three years later, Gayle understands the message. It’s one of bravery in the face of adversity, of quality over quantity, of thriving instead of enduring. Mary was no stranger to illness or pain when she discovered she had breast cancer at age 82. For years she had endured spinal stenosis and arthritis, which left her reliant on wheelchairs and walkers for mobility. It was the pain of those diseases that led to her unexpected breast cancer diagnosis when X-rays for a possible shoulder replacement revealed a dark spot. Mary consented to taking oral chemotherapy for a few months but chose to forego a lumpectomy, mastectomy, radiation or any other measures to treat her breast cancer. Mary is intimately familiar with the health care system. She is a graduate of the Kahler School of Nursing in Rochester and was a longtime registered nurse, only letting her license lapse when she turned 70. She was the first industrial nurse in Winona, tending to factory workers who were sick or injured on the job, and she later served as director of nursing at two nursing homes. From her lifetime of caring for others and coping with her own chronic pain and congestive heart failure, Mary knew that her body just couldn’t endure the rigors of breast cancer treatment. Now 86, she still doesn’t regret her decision to forgo treatment; it was the best choice for her personal situation. When her daughter Gayle understood the bravery behind her mother’s decision, she wanted Mary at least to enjoy the twilight. So she nominated her for the Healing Waters Project, a gift through RochesterWomen magazine and its partners which honors a woman with breast cancer by donating and building a water feature in her yard. Gayle thought the patio at her mother’s house would be a perfect spot for a Healing Waters fountain—where the gently gurgling water, luscious plants and the birds they attract would provide the comfort and soothing calm that are often elusive as Mary struggles with her health. 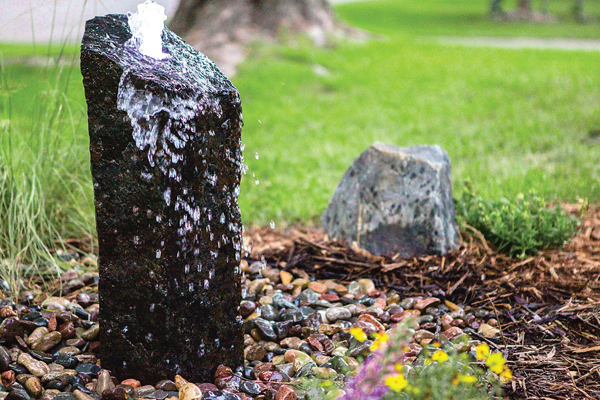 The fountain, designed and installed by Michael Otte, owner of Whitewater Gardens in St. Charles, features a bubbling urn with Mexican beach stones and complementary plantings, perfect for turning an ordinary patio into a private sanctuary. “It is compact, but Mary is able to hear the water and see the flowers from her favorite chair, and she seems to enjoy it very much,” Mike says. Mike launched the Healing Waters Project over eight years ago after one of his own friends was diagnosed with breast cancer. He still finds it touching every time a new fountain is installed. Mary continues to soak up all of life, including time with her children, 14 grandchildren and many visitors, as well as moments watching her fountain, which she was surprised to receive. Christine’s Landscape Design: designed, donated and installed the plants. This entry was posted in Personal & Professional on August 31, 2013 by Jennifer M. Gangloff.